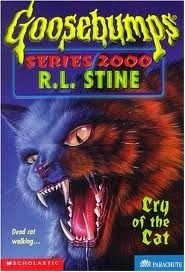 I was fully prepared to claim that the Goosebumps Series 2000 books were just regular Goosebumps books arbitrarily given a new name and layout to keep up with the changing market trends of 1998. Oh how wrong I was. Oh sure, Cry of the Cat is still very much identifiable as aGoosebumps book, but it also contains new elements not found in the sixty-two volumes which preceded it. Elements such as adults acting like adults, needless gore, and tornados made of cats. But I'm getting ahead of myself. Alison's friend Ryan shows up and they both ride their bikes to school for practice. See, both are starring in something called the Princess and the Jewel Thief, and they're in such a rush to make it on time that Alison decapitates a cat with her bike. Wait, she does what? I wrote that sentence and even I had to go back and read it again. The force of Alison hitting the cat with her bike sends the cat's head flying out into traffic with a shocked look of surprise on its face. With an expression that wide-eyed and in awe, I bet I know what that cat was thinking: "They renewed the Nannyagaaaaaaaaain?!?!"